Coverage: Ball-by-ball Test Match Special commentary on BBC Radio 5 live sports extra, Radio 4 LW, online, tablets, mobiles and BBC Sport app. Live text commentary on the BBC Sport website. Moeen Ali wants to open the batting for England on a permanent basis as the tourists prepare to face Pakistan in the second Test in Dubai on Thursday. The 28-year-old shared a century stand with captain Alastair Cook in his first outing as an opener in the drawn first Test in Abu Dhabi. Moeen, who also took two wickets with his off-spin, told BBC Sport: "It would be good for the team if I can do that - for the balance of the side. "You could always play two spinners." The Worcestershire all-rounder saw off competition from Alex Hales to open during the tour of the UAE and knows he will have to score heavily to hang on to the position for the trip to South Africa, where batting conditions are likely to be much tougher. "In the first innings I really enjoyed it," said Moeen, who made scores of 35 and 11. "It was a little bit slow but I felt it was about getting the team off to a good start after Pakistan had got 500-plus. "It was great to come off the field and go straight out to bat. "My role is to score runs at the top of the order, get the team off to a good start and then hopefully bowl the opposition out. "I just want to keep giving England a good start, which is really important here." Moeen and leg-spinner Adil Rashid returned combined figures of 0-284 in the first innings in Abu Dhabi, but shared seven wickets in Pakistan's second innings as England almost secured an unlikely win. Rashid picked up five wickets on debut to become the first England leg-spinner to take a five-wicket haul since Tommy Greenhough in 1959. "We grew up together and we are a similar age," said Moeen of Rashid. "We are pretty tight, but it's about doing a job for England. "With the one-dayers in the summer we kind of got used to it a little bit but it's nice to have another spinner, just so we can speak to each other and rub off each other a little bit." Rashid also earned the praise of captain Cook after bouncing back from first-innings figures of 0-163, the worst by a Test debutant. Cook said: "He's obviously had a tough introduction, the first day and a half not getting a wicket, bowling on probably the worst wicket you'd ever want to make your debut on as a leg-spinner when you lose the toss. "We know that leg-spinners come into the game later on. To get his rewards like he did, and bowl like he did, really sped up the game." The pitch for the first Test in Abu Dhabi was widely criticised for offering minimal assistance to the bowlers. It took until the final morning for the first two innings of the match to be completed, as Shoaib Malik and Cook ground out double centuries. And although England almost forced an unlikely win, Mooen hopes to see more pace in the wicket in Dubai. "It would be nice in terms of my bowling," he said. "Batting would be tougher but I don't mind that and it would be good for the game and good for the people watching." Pakistan will have leg-spinner Yasir Shah in their side after he missed the first Test of the three-match series with a back spasm. Shah, 29 and the fastest bowler to reach 50 Test wickets for Pakistan, is expected to replace seamer Rahat Ali. Pakistan captain Misbah-ul-Haq said: "He is back and that's a good sign for us. We missed him a lot in the first Test and his return will give us that boost in the spin bowling. "We really need to pull up our socks and the kind of fight England put in, we need to match them. I have confidence in my players that they can do that." Pakistan have also recalled off-spinner Bilal Asif as cover. Asif was reported for a suspect bowling action in Zimbabwe on 6 October, but can play pending a report on his action, which is expected to be completed in two weeks. 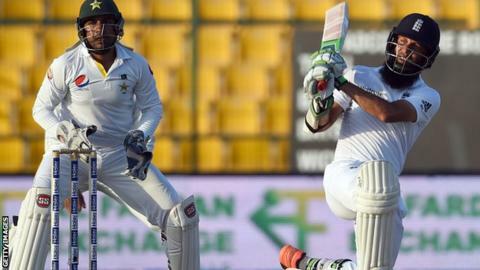 However, Pakistan are likely to be without batsman Azhar Ali, who returned home following the death of his mother-in-law and may not receive a United Arab Emirates visa in time. England all-rounder Ben Stokes has had a stomach upset but will be fit to play. Pakistan squad: Misbah-ul-Haq (captain), Ahmed Shehzad, Shan Masood, Azhar Ali, Mohammad Hafeez, Fawad Alam, Asad Shafiq, Younis Khan, Shoaib Malik, Sarfraz Ahmed (wk), Yasir Shah, Zulfiqar Babar, Wahab Riaz, Imran Khan, Rahat Ali, Junaid Khan, Bilal Asif. England squad: Alastair Cook (capt), Moeen Ali, James Anderson, Samit Patel, Jonny Bairstow (wk), Ian Bell Stuart Broad, Jos Buttler (wk), Alex Hales, Liam Plunkett, Adil Rashid, Joe Root, Ben Stokes, James Taylor, Mark Wood, Chris Jordan.